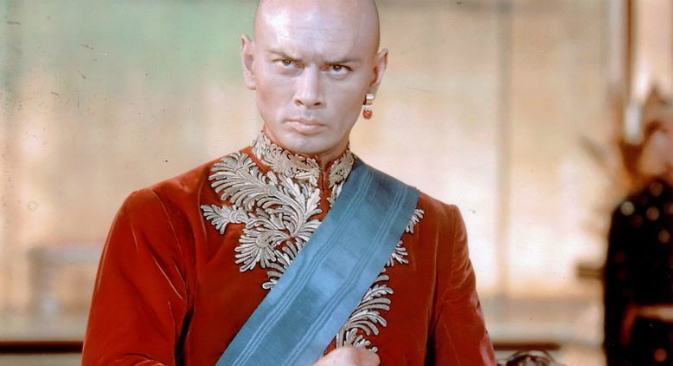 The King and I, a Rodgers and Hammerstein musical based on the experiences of an English governess to the children of King Mongkut of Siam, starred Yul Brynner, who was born in Vladivostok and spent the early part of his life in the Russian Far East and Harbin. King Mongkut of Siam (Rama IV) is known as the “father of science and technology” in Thailand, since he chose to embrace Western scientific innovations and slowly opened up the country to the outside world in the 19th century. The experiences of Anglo-Indian educator Anna Leonowens as the governess to the children of King Rama IV were first penned down in a novel by Margaret Landon and then adapted into a musical and film by Richard Rodgers and Oscar Hammerstein II. The man who played the lead role in the musical and film and become the face of Thailand in the West was Yul Brynner, a Russian-born actor. Yuliy Borisovich Brynner, who played the role of King Rama IV a total of 4625 times on stage, was born in 1920 in the Russian Far Eastern city of Vladivostok. In ‘Yul: The Man who would be King: a Memoir of Father and Son,’ Rock Brynner wrote that his father exaggerated his background claiming he was born in Sakhalin as Taijde Khan. Some residents of Sakhalin still believe that the Hollywood actor was born on the island, but his actual birthplace is now a famous tourist attraction in Vladivostok. Brynner was born into one of the richest families in the Russian Far East. His grandfather, Julius was a Swiss citizen who moved to the Russian Far East in the 19th century and had a business empire that stretched to the Korean peninsula. Historical records indicate that the Romanov Dynasty’s quest to protect the Brynner family’s business interests was among the factors responsible for the 1905 Russo-Japanese War. According to Rock Brynner’s book, Yul moved with his sister and mother to Harbin in the 1920s and later to Paris, where he tried a variety of jobs from being a guitar player to a member of a circus troupe. He immigrated with his family to the United States in 1940 and got his first major break in 1951, when he was chosen to play the role of King Rama IV for the Rodgers and Hammerstein play, the King and I. Brynner won the Tony Award for the Best Featured Actor, but his greatest achievement came in 1956 when he won the Oscar Award for the Best Actor in the film adaptation of the musical. Others in Thailand were not happy about an ethnic European acting as one of the greatest kings of the Chakri Dynasty, Samprasong adds. “Of course, we know that Brynner did have some Mongolian blood and could have passed off as someone with mild Asian features,” she says. A more recent depiction of King Rama IV and Anna Leonowens that starred Chow Yun-Fat and Jodie Foster was also banned in Thailand. A 1930 censorship law in the kingdom prohibits film-makers from portraying the Thai monarchy in a disrespectful way. Those violating the law could even face a 7-year prison sentence. Samprasong argues with Thais who feel offended by Brynner’s performance as the king. “The film shows the grandeur of the royal palace and Brynner did a better job as acting as a Thai monarch than many Westerners who acted as Asians in old Hollywood movies,” she says. The historian adds that there are many fascinated tourists who still choose to visit Thailand after watching the classic. Thailand’s Queen Sikrit met Brynner in New York in March 1985 and saw the film that was banned in her country. “There was nothing to indicate that Her Majesty found the film offensive,” Samprasong says. Brynner, who was also famous for playing Rameses II in The Ten Commandments, passed away in October 1985 and was buried in a Russian Orthodox Monastery in France. For a generation of Americans, the Russian actor was the face of a country that was viewed as one of the mysterious places in the Orient.